Congratulations to Nikonians Gold member David Metta (Merlin50), of Illinois, USA. He's the winner for the April segment of our Best of Nikonians - 2010 Images Photo Contest. He won the segment theme "Birds" with an image he calls: Size, largely a matter of perspective. David made his photograph with his Nikon D700 and AF-S VR Zoom-NIKKOR 70-200mm f/2.8G IF-ED lens at an f/22 aperture. His shutter speed was 1/320 sec and ISO was set to 200. 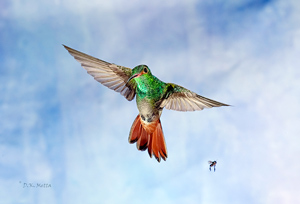 It shows a Rufous-tailed Hummingbird (Amazilia tzacatl) in flight, with a tiny insect nearby. The image was captured in Panama at the Soberania National Park, roughly 25 kilometers (15 miles) from Panama City. As his prize, he will receive from Think Tank Photo an Airport Ultralight™ V2.5 backpack valued at $169.00 USD. At the end of the year, the Nikonians Masters Society, composed of outstanding professional and distinguished advanced amateur photographers around the world, will include Dave's April winner as they select the First Place winner of the Best of Nikonians - 2010 Images Contest. For our Silver, Gold and Platinum members, check our complete details and a guide on how to prepare your entries for our Photo Contest and enter your shots now. Our May segment is currently under way. Please remember that the main subject for this month is a mode of transportation. The longest size of the photograph must be between 900 and 1024 pixels.